Child Exploitation and Chocolate | Shop Ethical! 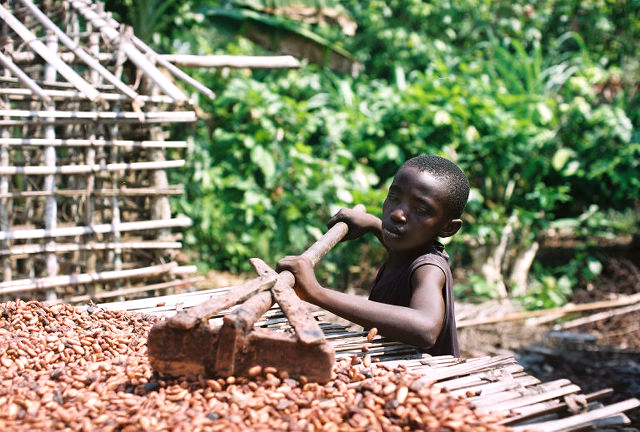 Since 2000 the chocolate industry has been under scrutiny for using cocoa beans from West Africa as many cocoa farms in this area use child labour. Approximately 70 per cent of the cocoa beans used to make the worlds chocolate comes from West Africa. It is estimated that the Ivory Coast has 300,000 children working in dangerous conditions with more half of these children under the age of 14. The work includes spraying pesticides, using machetes and carrying heavy loads. The children have no access to education or healthcare and physical abuse is common. While being aware of this issue for more than ten years the international chocolate industry has only recently made some significant progress. Cadbury now has Fairtrade certification on its Dairy Milk branding, while Mars and Nestle have some products certified under the UTZ and Rainforest Alliance schemes (both called “Fairtrade light” by critics, as they offer producers no minimum or guaranteed price for their crop). These changes are positive but greater corporate responsibility is required to end child exploitation. See Salvation army page promoting Stop the Traffik’s Easter resources – lots of useful things, including Certified Choc egg buying guide. Join the Stop the Traffik Creating Sweet Magic? postcard campaign, encouraging Darrell Lee to source certified cocoa.